The President of the Maldives, Mohamed Ibrahim Solih, who defeated the former pro-China president Abdulla Yameen in what was described by media as a shock election in October, is in New Delhi on his first ever state visit to a foreign country. 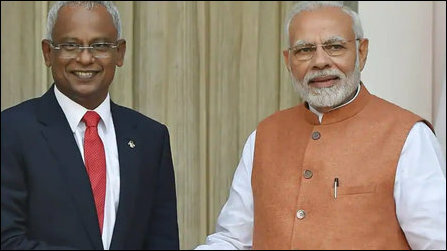 Mr Solih, elected to power with an “India-First Policy,” has inked four pacts with New Delhi during the visit on Monday. During the occasion, Indian Prime Minister Narendra Modi has announced USD 1.4 billion financial assistance to the Maldives, which is yet to find out how much it owes to China following the infrastructure projects initiated during the Yameen regime (2013-2018). New Delhi's diplomatic relations with Malé were in shambles during the ‘pro-China’ Yameen Government. The visit by the Maldivian President comes a month of after his election as well as the four Quad countries, USA, India, Japan and Australia, agreeing to engage with smaller states in the Indo-Pacific in a “coordinated and complementary manner,” mainly to deal with the tilt towards China and its Belt and Road Initiative. The visit comes also four days after US Deputy Assistant Secretary of the Central and South Asian affairs David J. Ranz visited Malé and announced US$7 million in “foreign military financing” to Maldives maritime security and its territorial control of waters as well as a US$3 million assistance to support “civil society and help protect Maldives environment”. Last month, the Quad countries agreed on their maritime outlook was to be shaped through the Association of Southeast Asian Nations (ASEAN). The approach has been floated as the ASEAN centrality. The ASEAN-led regional architecture of the Quad formation seeks to involve other regional institutions such as the Indian Ocean Rim Association (IORA) and the Pacific Islands Forum (PIF). Four pacts were signed between the two countries during the meetings in New Delhi. These were, Agreement on the Facilitation of Visa Arrangements, Memorandum of Understanding (MoU) on Cultural Cooperation, MoU for Establishing Mutual Cooperation to Improve the Ecosystem for Agribusiness, and a Joint Declaration of Intent on Cooperation in the field of Information & Communications Technology (ICT) and Electronics. The Quad formation looks at maritime and cybersecurity as a combined factor. India, with the ICT infrastructure agreement with the Maldives, has ensured the interests of the Quad formation. “The two leaders agreed to strengthen cooperation to enhance maritime security in the Indian Ocean Region through coordinated patrolling and aerial surveillance, exchange of information and capacity building,” a joint statement issued by the leaders of both the countries stated on Monday. Modi and Solih also reiterated their assurance of “being mindful of each other’s concerns and aspirations for the stability of the region and not allowing their respective territories to be used for any activity inimical to the other,” the statement said. It was also agreed to intensify cooperation in the areas of training and capacity building of Maldives Police Service and Maldives National Defence Force. Following the strengthening of US-India military ties, both the major strategic partners have been talking of the ‘Bay of Bengal Initiative’ for military coordination of the small state actors in the Bay of Bengal region as India was not interested in a military training programme through the SAARC grouping as it wanted to exclude Pakistan. Thus, a military agenda has been pushed through the BIMSTEC in the recent months. The Maldives is not a BIMSTEC member. The Maldives was also not a member of IORA until November this year. The atoll nation is now an official IORA member. Malé, during its pro-China tilt, severed its connection with the Commonwealth, especially since October 2016. After winning the election on a pro-India campaign, Solih sent an application to re-join the Commonwealth on December 07. “The Prime Minister of India welcomed Maldives’ decision to re-join the Commonwealth. The Prime Minister also welcomed Maldives as the newest member of the Indian Ocean Rim Association,” said the joint statement issued by Modi and Solih in New Delhi on Monday. Last month, Modi was attending Solih's swearing-in ceremony, which was held in Malé on November 17. During Solih's three-day visit to New Delhi this time, he is staying in the Rashtrapati Bhawan. “This demonstrates the close ties between India and the Maldives,” the joint statement between the two leaders said. The President of Maldives has also reiterated his country's support for India's candidature for permanent membership of an expanded and reformed UN Security Council, the joint statement further stated.